Chic night skincare routine#1 | Chic first: an elegant view on beauty, fashion and lifestyle. Okay let’s say it’s the night before that important date on your agenda. You want to look fabulous. You must look fabulous. And most of all, you must feel fabulous. And let’s add that you haven’t got a millionaire’s budget to invest in a spa treatment, nor have weeks to get ready for that important date. You have just one night. So let’s keep things simple! Go to sleep early – The best way to have a juicy, pinky, beautiful skin the day after is to sleep enough. “Enough” can be subjective, but don’t give yourself less than 7 hours of sleep. Naps are the best preparing for wrinkles, blemishes, dullness and greyness. And your goal is to look fabulous, remember? Prepare your outfit, bag, belongings in advance – Even if your date is not planned for the morning, but in the evening, having all your clothes, accessories, files, and whatever you may need at hand will help you feel less “in a hurry”. Clean your face with a delicate product – My recommendation is a good micelle solution, such as Bioderma Sensibio H2O which is for sensitive skin and removes all makeup from eyes, face and lips, as well as any impurities (so good also if you’re not wearing make up) maintaining the balance of the skin. Quench your skin’s thirst – In this season, nothing can be as fresh and nice as a generous spray of thermal water on the face. 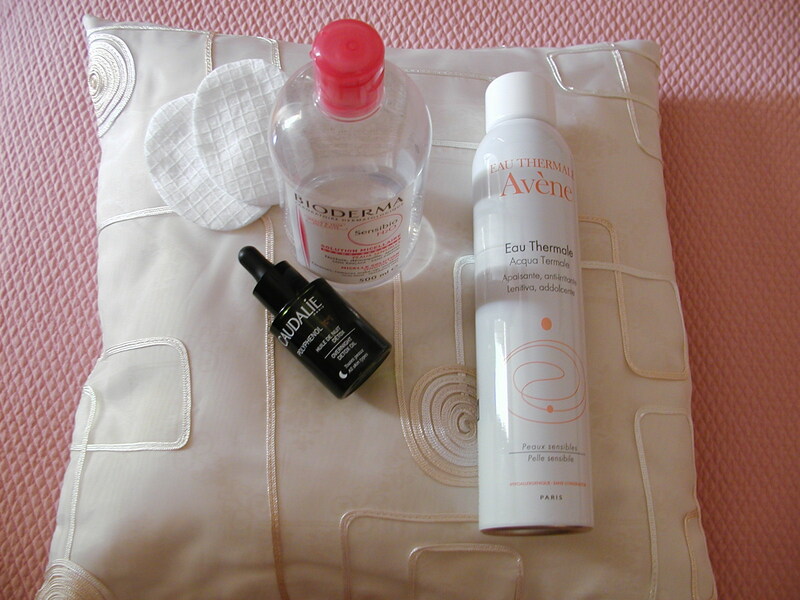 Among the dozen products you can find in this area, Avène Thermal Water Spray is a classic. Although formulated for allergic, hypersensitive and irritated skin, it works amazing on all skin types. You can bring a bottle with you at the seaside, at the gymn, or even in the office to refresh face and body whenever needed. Put a hero at your side – Protecting your skin from the aggressions of daily life: stress, aging, UV rays, pollution, smoke, etc requires something very very very special. Among the serums, Caudalie Polyphenol C15 Detox Oil is in my opinion this super hero. Don’t be mislead by the fact it’s an oil: it’s not too much for summer, since it doesn’t leave your skin greasy or tacky. What I like of this product is the fact it’s 100% plant-based, and contains no parabens, no sulfates, phtalates or mineral oils. Once you open the package, you’ll be certainly surprised by its rich herbal smell, especially if you normally wear fragrance-free products. How to use it? The producer advises to pump 6 drops on the hands and to massage gently on the face. While you sleep, it helps your skin recharge, heal and fight against free-radicals and dead cells. The day after, as you wake up, you’ll see a better-looking skin, which is the first step for a “I feel fabulous” attitude. Isn’t it? And what about you? How’s your night skin care routine in this period? Are there any smart and most of all “risk-free” products you would recommend? This entry was posted in Beauty, Skin care, Spring/Summer and tagged Avène, beauty, Bioderma, caudalie, chic, chicfirst, skin care. Bookmark the permalink. I’m so curious about the Caudalie Polyphenol C15 serum. When I was in Paris these had just launched and were advertised in every pharmacy but I didn’t want to spend that muh money without any research. The Body Shop Vitamin E Serum-In-Oil is another great night treatment! Hi Reify and thanks for the suggestion. I like most of The Body Shop products and I agree with you: it’s important to read people’s review to understand if something is worth the purchase. Believe me, this product is very good: it’s not stuffed with bad chemicals and on top of that is fantastic if your skin looks a bit dull or stressed. Sounds great! This is going right on my wishlist!